The Occupy Cars system will be comprised of all the essential components you need to convert your ordinary gaz-fuzzler to electric. The development has already begun with the BORGI-Hubmotor which seems to be a promising architecture for a simplified conversion and potentially allows for 2WD as well as 4WD setups. The files for the BORGI prototype can be downloaded down below via GitHub. You can join the revolution by participating in our community, subscribing to our Twitter, Instagram and Medium channels. Contribute to our open source GitHub projects! "BORGI axial motor was mainly designed for cars, but their project is so cool and too tempting not to be used as an electric motorcycle hub motor, electric motorcycle and tricycle mid-motor. The sky is the limit, and that is why we support these fine gentlemen in their goals." You can support Occupy Cars by sporting some of our revolutionary apparel! All merch sales will contribute to the development of Occupy Cars! 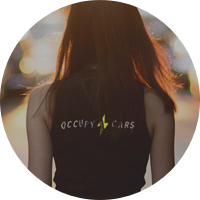 Occupy Cars is a group of technical enthusiasts who want to speed-up the sustainable mobility revolution and to help slowing down climate change. A few of us founded the startup CARION.IO which supports Occupy Cars with the development. We love cars but we also realize that 100 years of combustion engine vehicles left a mark on planet earth. Thousands of people die because of combustion engine related air polution. And in order to avert the most catastrophic climate change scenarios we have to rebuild our mobility and energy sector fast. The car industry is slowly following the lead of Tesla, but even with todays production capacity fully dedicated towards the production of electric vehicles, the transition of the world-wide fleet would still take 30-40 years. We think that if all the interested people would be involved and enabled via open source knowledge, we could all probably be driving electric in 5-10 years. Isn't this hightech stuff super complicated? The reality is that you can build an electric conversion car out of 90% recycled resources, with internet knowledge, and some maker skills and tools, available in modern fablabs or shared workshops. If you are super skilled with your manual tools, you can even do it without all the fancy 3D Printing and cnc-milling. Why the 3D-printing and cnc-milling then? 3D-Printing and cnc-milling allows to speedup and streamline the process. Furthermore it enables to setup microfactories to produce the components locally, more cost effective and sustainably. Why is converting old cars to electric sustainable? First of all, the most cars on the road today are not old, they are recently produced computers on wheels, they just have a terribly unsustainable combustion engine in them. The conversion of these vehicles is very sustainable because these things have already been built with the help of vast amounts of energy and resources. We don't need to produce them again. Converting them to electric is just a minor intervention in comparison to building a new electric vehicle. Why are cars such a big deal anyways? Cars allowed for the modern world to emerge. If you watch closely, you will notice that our contemporary world is actually built around cars itself. The most pressing problem for the current and following generations living on this planet emerged from humans building its infrastructure, industry and economy around cars with combustion engines. With nearly 2 billion cars on the road, the emission from the running cars alone amount to almost 15-20% of global greenhouse gas emissions. The whole car sustaining system not counted in. Furthermore, combustion engine cars are max. 30% fuelefficient compared to the 90% of an electric car. That means only 30% of the energy we use in our combustion cars is used for locomotion, the rest is waste heat. It's quite obvious that electric cars are the better choice. We simply increase the potential scaling effects for retrofitted eletric car technology if we lower the entry barriers for newcomers to engage in the field. An open source electric drivetrain would allow for the emergence of a global but localized electric car industry which could build on a common technological subset. If we share the development and production in a global community, the cost of development, as well as the cost of the components will be significantly lowered. Are conversions the worse electric car? Conversion Electric Vehicles can be just as great and fun than the new ones from the factory. They will be more unique and more interesting though. The range of conversion electric vehicles will be lower in the beginning, but they will be totally sufficient for your daily needs. As new battery technology comes in, the range of conversion electric cars will increase as well. How far is Occupy Cars in development? We are early in the development cycle but have already published a part of our development. It will take a while to get the Occupy Cars on the road but we hope to have the first test vehicles on the ground in 2019. You can help speed things up with contributing to the project. Will this be road legal? We are working towards getting the Occupy Cars system roadlegal, but it will take longer in europe as the restrictions and regulations are quite tough. Could this be an alternative to SCR-Filter retrofits for diesel cars? Yes we think this technology could almost achieve cost parity with scr-filter solutions. It would be the better solution to the diesel-pollution problem as it would get rid of the diesel problem (aka Dieselgate) completely. As the retrofit filters will take two more years to get to market, we might get it done in the same time. Do you have more questions? Drop us a line.